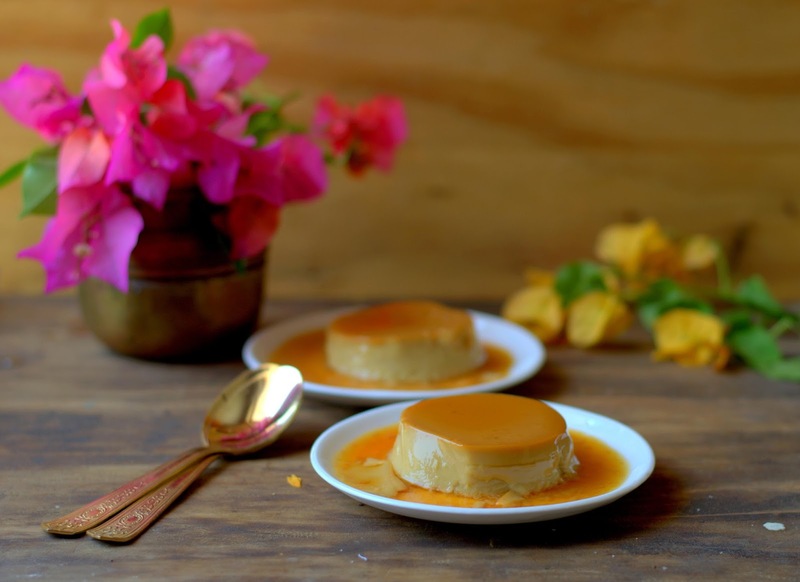 Cakes & More: Butterscotch Flan. To Celebrate A Milestone! 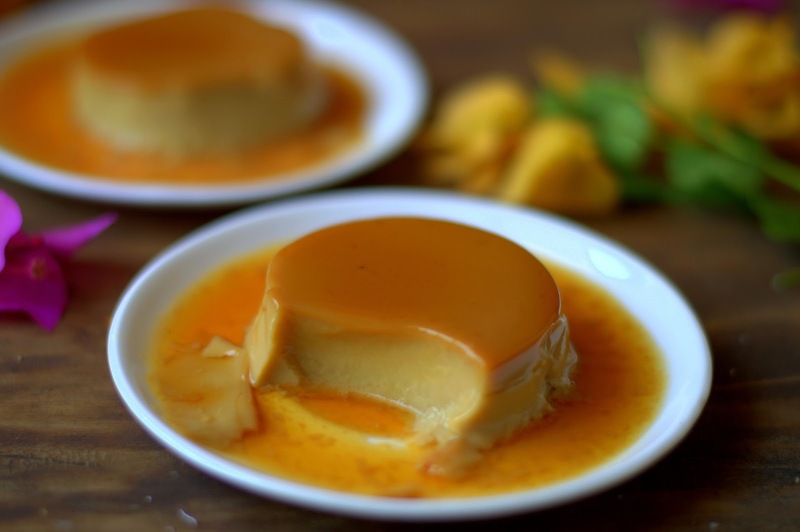 Butterscotch Flan. To Celebrate A Milestone! Hello! Anyone there? My blog statistics tell me I do have a few kind folks dropping by, reading my ancient posts. Thank you! On a side note, my YouTube Channel statistics shows we have just crossed 25,000 subscribers, so I had to document it here! If you are new around here, my channel is for beginners in baking, more relevant if you happen to live in India. You can find videos on oven basics, baking ingredients, how-to's, simple recipes to help you get started and more. Hope you will swing by! Do leave your comments for me, share the link with a friend who wants to start baking. Oh yes, please do subscribe for more videos coming up!Click here. Please follow my page on Facebook for updates on new videos for beginners in baking, every Monday! For me, any celebration is synonymous with dessert, if it is a new recipe I try, even better! Never mind if it is again a variation of a baked custard. Wobbly, soft set, silky smooth flans with a butterscotch flavor I thought was incredible! It is wondrous how simple ingredients like milk, cane sugar and eggs can transform into such deliciousness! 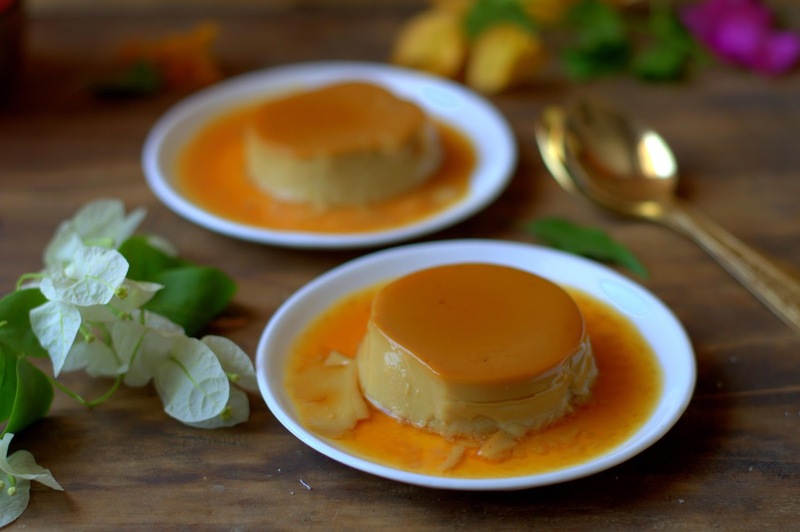 As if it wasn't spectacular enough in its simplicity, David Lebovitz gilds the lily baking the custards in caramel-lined ramekins to make Butterscotch Flans. Delighted to add this one to the eternal favorites desserts list! If you are yet to try caramel, this post of mine may help. If you do not feel up to it, try baking just the custards using cane sugar and I promise you won't be disappointed. The wet caramel stays liquid for hours so you don't have to be in a scurry to use it, another keeper of a recipe! I made half the recipe below to make about 7 small flans. Butterscotch Flan from David Lebovitz's Ready For Dessert. Pinch of crème of tartar or a few drops of lemon. Method : Set 125 ml - 180 ml ramekins or custard cups in a large deep baking pan. I have used small ramekins, about 80 ml capacity. To make the caramel, spread the 3/4 cup of sugar in an even layer in a medium heavy-bottomed saucepan. Pour 1/4 cup water evenly over the sugar to dampen it, but do not stir. Cook over medium heat until the sugar dissolves, then add the cream of tartar or lemon juice. Continue to cook without stirring but swirl the pan if the sugar begins to brown unevenly. When the caramel turns a dark amber in color and begins to foam a bit, remove from the heat and immediately add the remaining 1/4 cup water. The caramel will bubble up vigorously, then the bubbling will subside. Stir with a large spoon until any hardened bits of caramel completely dissolve. Divide the hot caramel among the ramekins. Carefully swirl each ramekin so that the caramel coats the sides halfway up. Let cool completely. To make the custard, in a medium saucepan, heat the milk until warm (mine was hot). In a medium bowl, whisk together the eggs and egg yolks. Gradually whisk the warm milk into the eggs, whisking constantly as you pour to prevent the eggs from cooking. Add the cane sugar, vanilla and salt and whisk until the sugar completely dissolves. Pour the mixture through a fine mesh strainer into a large pitcher. Divide the custard mixture evenly among the caramel-lined ramekins. Fill the baking tin with hot water ( warm water David says) to reach half-way up the sides of the ramekins. Cover the pan tightly with aluminum foil and bake until the perimeters of the custards are just set and the centers are still jiggly, 25-35 minutes. Mine took about 25 minutes to bake. Do not over-bake or the custards will be rubbery. Err on the side of under-baking. Transfer the custards from the water bath to a wire rack and let cool completely. Cover with cling film and refrigerate until chilled 3- 4 hours, overnight is better. To un mold, run a sharp knife around the inside of each ramekin to loosen the custard. Invert a serving plate over the ramekin. Shake a few times to release the custard, then lift off the ramekin. Pour any caramel remaining in the ramekin over the flan. Serve cold. The baked flans can be stored for 3 days in the refrigerator. Please note: The recipe for custard uses packed 1 1/4 cup / 275 grams dark brown sugar. I have used Amrit cane sugar, the weight for packed 1/2 cup plus 2 tablespoons was 100 grams. David suggests experimenting with different kinds of sugar in the custard such as Miexican piloncillo, Asian palm sugar and dark turbinado sugar. Not a bad idea to sit back and savor this make-ahead, delish and light summer dessert this weekend I guess? So do you have some eggs, milk and sugar at home? Congratulations Suma on reaching that milestone. Well deserved. Hope you achieve great success with your video channel. And that flan looks decadent. I could eat them by dozens!